Gli intensificarsi dei rapimenti in Nigeria sono l'ennesimo effetto collaterale conseguente alla guerra di Libia e l'intervento in Mali. Come in un domino la forza dei movimenti jihadisti aumenta in questa regione dell'africa occidentale. Da metà febbraio, 14 stranieri sono stati rapiti in Nigeria e Camerun in 2 attacchi separati. Nessun gruppo ha rivendicato il 2° attacco del 19 febbraio ma l'area è molto vicina ai territori di Boko Haram. Ansaru (una cellula vicina a Boko Haram) ha rivendicato il 1° attacco.Mentre i target di Boko Haram sono stati per lo più in Nigeria, Ansaru ha già portato a termine molto rapimenti, di cittadini o supporter Francesi per lo più, in Mali e Camerun. sarà vero dopo miss italia avere... ?! ..Boko Haram's capabilities in 2012 were limited to soft targets near the group's base of operations in northeastern Nigeria. 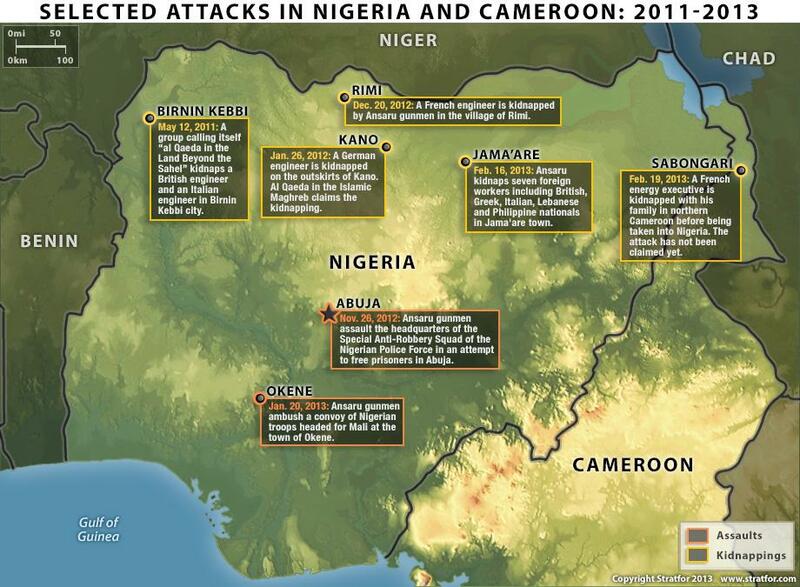 Ansaru has emerged over the past year and appears to have surpassed Boko Haram in its range of tactics and targets. Ansaru has relied on armed attacks and kidnappings rather than suicide bombings. Ansaru's targets have included foreigners and those involved with the intervention in Mali, while Boko Haram's targets have been Nigerian. Nearly all of the Ansaru attacks since December 2012, as well as the unclaimed kidnapping in Cameroon, have targeted French nationals or those supporting French operations in Mali. This has raised the fear that widespread kidnappings will be the fallout from the Mali intervention. A continuation of this violence could harm foreign interests in Nigeria and surrounding countries and strengthen militant jihadism throughout the region.